Leave behind the stress of everyday life, and come imbibe some incredible libations at our favorite New Hampshire distilleries that you need to visit. Rest up and relax at our romantic bed and breakfast in New Hampshire, where privacy, delicious cuisine, and relaxation await at one of the most unique and accommodating inns in New England. Then head out and explore the local villages and countryside of Chesterfield, home to some of the best distilleries around. Return in the evening and savor a sumptuous dinner in our candlelit dining room. This is the place for your romantic New Hampshire getaway and ultimate adventure for any aficionado of craft distilled spirits and creative cocktails! Hand-Crafted Aged Rum is aged with white oak and white ash chips for a minimum of 6 weeks. Hand-crafted Clear Rum is aged for 6 months to 2 years and has a smooth flavor with hints of vanilla and smoke. Just over 6 miles away in Vermont is Saxtons River Distillery, crafting the highest quality spirits since 2006. Savor their sapling maple liqueur, a unique taste that is quintessential Vermont – small batches are matured in American oak, delivering an exceptional liqueur with a bold flavor, but always smooth and never too sweet. Enjoy Sapling neat, as the perfect compliment to coffee or create your own signature drink. Their sapling Maple Rye is a small batch, hand-crafted blend of aged American rye whiskey and select Vermont maple syrup that also goes through a second maturation in American oak to provide a unique exquisitely balanced, exceptionally smooth taste. Perc Coffee Liqueur combines artisanally roasted and cold brewed specialty grade Arabica beans infused with their exceptionally pure liquor to lightly sweeten the blend. Snowdrop Gin is a vacuum distilled American Dry Gin containing juniper, ginger, cardamon, coriander, orange zest, and star anise to create a smooth sipping or mixing spirit with a subtle and beautiful medley of flavors distilled through a process that few distilleries in the world have attempted. Check out their website for a variety of creative cocktail recipes that can be made from their products. 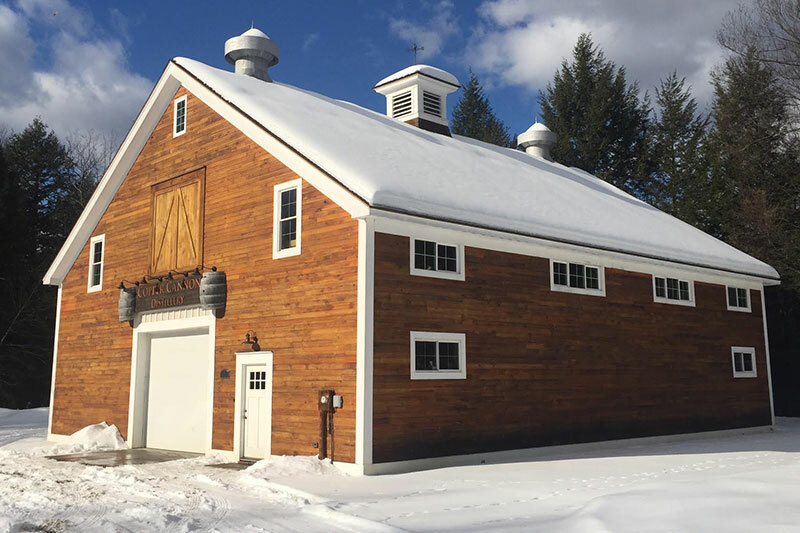 New England Sweetwater Farm and Distillery is just over 16 miles away in Winchester, NH, and produces smooth, sip-able handcrafted spirits in small batches which perfectly capture the flavors of the region. They ferment and distill “on the grain” to draw out the subtle and unique flavor profiles in the locally grown ingredients used in their distilling process. 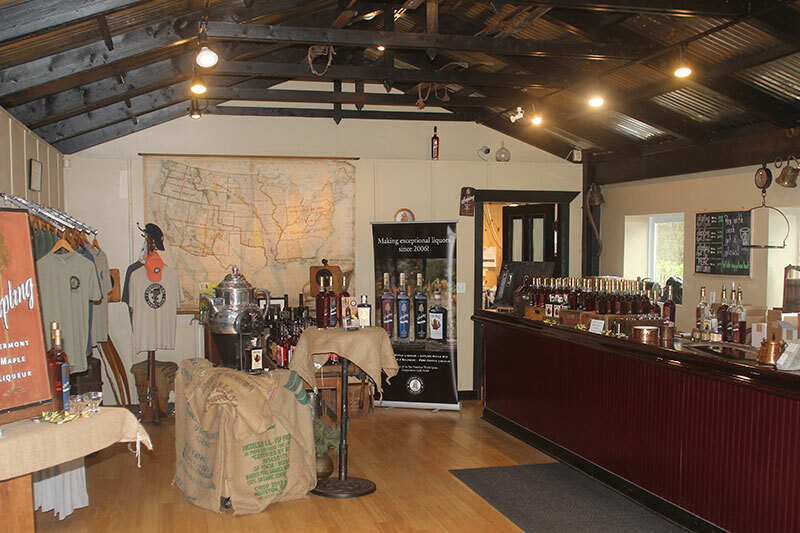 You can experience a variety of hand crafted distilled spirits here. 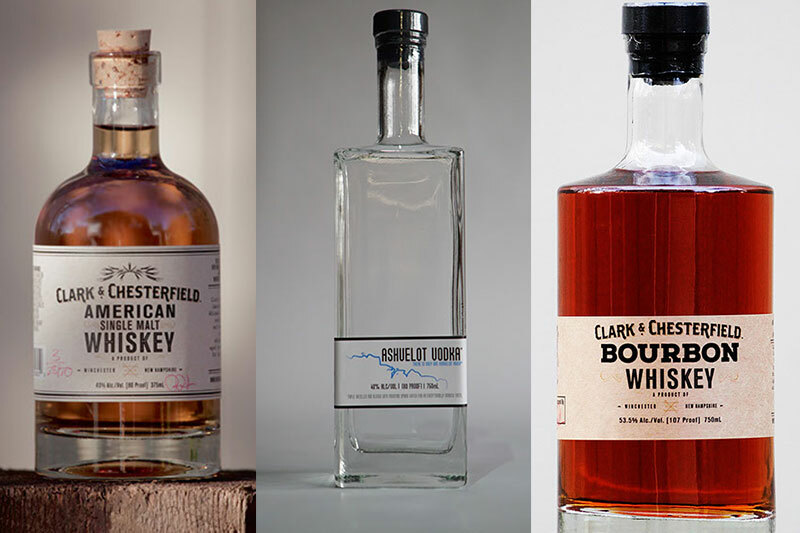 Clark & Chesterfield American Single Malt Whiskey is double distilled from a 100% barley mash then solera aged in used bourbon barrels sourced from Few Spirits Distillery. Ashuelot Vodka is triple distilled from a unique Apple and Potato mash with a clean and smooth flavor and hints of apple on the nose and a dry potato finish. Clark & Chesterfield Bourbon Whiskey is distilled from Raw Yellow corn, Rye, and Malted Barley aged in full size New American Oak barrels. Ashuelot Gin™ is a unique American style Gin with light, bright profile created using Sweetwater’s Ashuelot Vodka distilled from locally grown apples and potatoes and distilling it again and vapor infusing it with 8 botanicals. Ashuelot Gin Reserve is their signature gin made from local apples and potatoes, then aged in used whiskey barrels previously filled with our Solera Aged Clark & Chesterfield American Single Malt Whiskey to produces a golden spirit with higher juniper notes and a delicious blend of whiskey and oak. Kingfish Gold Rum is a true New England style Rum that is distilled from American Black Strap molasses using the techniques of the Colonial American distillers to produce flavors of Citrus and sugary caramels. Other options, available for purchase at nearby stores, include Kingfish Colonial Spiced Rum, Kingfish Silver Rum, and regular Monadnock Moonshine. After a day of exploring the area and savoring some distilled spirits, sit in front of the fire in the elegant parlor at our romantic New Hampshire Bed and Breakfast or gaze out the window with a view of the meadow with its cloud of wildflowers. Turn in to your romantic room and enjoy a restful night’s sleep in your four-poster beds with luxury linens, and wake up to a leisurely homemade breakfast cooked to order in the porch dining room. 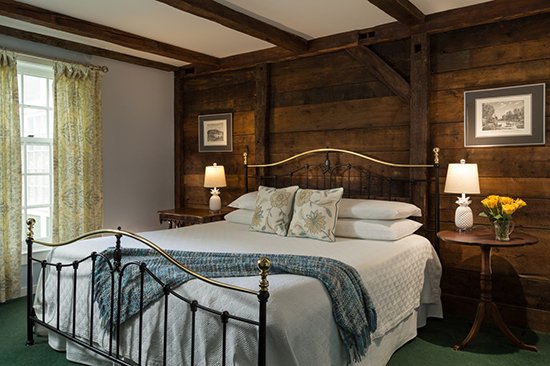 Choose a room in the main inn, an old farmhouse with a barn that was renovated into a country inn with large, comfortable guestrooms. Or stay in The Cottage, with rooms featuring whirlpool tubs, gas fireplaces and private decks stepping out to the back lawn. Or book a stay in the Johanna Weatherby Building, built in 1992, named for the property’s first owner from the late 1700′s. Book your stay today and plan your next adventure.